Indian removal was a policy of the United States government in the 19th century whereby Native Americans were forcibly removed from their ancestral homelands in the eastern United States to lands west of the Mississippi River, thereafter known as Indian Territory. That policy has been characterized by some scholars as part of a long-term genocide of Native Americans by European settlers to North America in the colonial period and citizens of the United States until the mid-20th century. The policy traced its direct origins to the administration of James Monroe, though it addressed conflicts between whites and Indians that had been occurring since the 17th century, and were getting worse by the early 19th century as white settlers were increasingly pushing west. The Indian Removal Act was the key act that enforced Indian removal, and was signed into law by President Andrew Jackson on May 28, 1830. Some of the American Revolutionary thinkers and leaders viewed the American Indians not as a single people, but as nations in their own right, and developed early policies for the new United States to interact with Indian tribes. However, these did not meet with approval of their colleagues and later presidents like Andrew Jackson who wanted Native Americans to be banished from their land or annihilated to enable European settlers to use this land. Thomas Jefferson, in his Notes on the State of Virginia (1785), defended American Indian culture and marveled at how the tribes of Virginia "never submitted themselves to any laws, any coercive power, any shadow of government" due to their "moral sense of right and wrong". He would later write, "I believe the Indian then to be in body and mind equal to the whiteman". His desire was for the Native Americans to intermix with European Americans and to become one people. (p137) To achieve that end, President Jefferson would - in addition to offering U.S. citizenship to some of the Indian nations - propose lending credit to them for trade with the expectation they would be unable to honor their debts and thereby the United States would acquire their land. President George Washington, while addressing the Seneca nation in 1790, publicly pledged to uphold their “just rights” and described the pre-Constitutional defrauding of the Indians out of their land as “evil”. In March and April of 1792, Washington met with 50 tribal chiefs in Philadelphia – including the Iroquois – to discuss closer friendship between them and the United States. In 1795, in his Seventh Message to Congress, Washington expressed that if the US government wanted peace with the Indians, then it must give peace to them, and that if the US wanted raids by Indians to stop, then raids by American "frontier inhabitants" must also stop. The U.S. Constitution of 1787 (Article I, Section 8) calls for regulating commerce with the Indian tribes, and makes their importance to Congress equal to that of the states and foreign governments. In 1790, Congress passed the Indian Nonintercourse Act (renewed and amended in 1793, 1796, 1799, 1802, and 1834) to protect and codify the Indians’ land rights. Go on then, brother, in the great reformation you have undertaken.... In all your enterprises for the good of your people, you may count with confidence on the aid and protection of the United States, and on the sincerity and zeal with which I am myself animated in the furthering of this humane work. You are our brethren of the same land; we wish your prosperity as brethren should do. Farewell. I am glad, brothers, you are willing to go and visit some other parts of our country.... we thank the Great Spirit who took care of you on the ocean, and brought you safe and in good health to the seat of our great Council; and we hope His care will accompany and protect you, on your journey and return home; and that He will preserve and prosper your nation in all its just pursuits. With our Indian neighbors the public peace has been steadily maintained.... And, generally, from a conviction that we consider them as part of ourselves, and cherish with sincerity their rights and interests, the attachment of the Indian tribes is gaining strength daily... and will amply requite us for the justice and friendship practiced towards them.... [O]ne of the two great divisions of the Cherokee nation have now under consideration to solicit the citizenship of the United States, and to be identified with us in laws and government, in such progressive manner as we shall think best. Years after the Jefferson presidency, in 1817 the U.S. government would again offer citizenship to the Cherokee who lived east of the Mississippi River, along with 640 acres per family. When they withdraw themselves to the culture of a small piece of land, they will perceive how useless to them are their extensive forests, and will be willing to pare them off from time to time in exchange for necessaries for their farms and families. To promote this disposition to exchange lands, which they have to spare and we want, for necessaries, which we have to spare and they want, we shall push our trading uses, and be glad to see the good and influential individuals among them run in debt, because we observe that when these debts get beyond what the individuals can pay, they become willing to lop them off by a cession of lands. At our trading houses, too, we mean to sell so low as merely to repay us cost and charges, so as neither to lessen or enlarge our capital. This is what private traders cannot do, for they must gain; they will consequently retire from the competition, and we shall thus get clear of this pest without giving offence or umbrage to the Indians. In this way our settlements will gradually circumscribe and approach the Indians, and they will in time either incorporate with us as citizens of the United States, or remove beyond the Mississippi. The former is certainly the termination of their history most happy for themselves; but, in the whole course of this, it is essential to cultivate their love. As to their fear, we presume that our strength and their weakness is now so visible that they must see we have only to shut our hand to crush them, and that all our liberalities to them proceed from motives of pure humanity only. Should any tribe be foolhardy enough to take up the hatchet at any time, the seizing the whole country of that tribe, and driving them across the Mississippi, as the only condition of peace, would be an example to others, and a furtherance of our final consolidation. Our system is to live in perpetual peace with the Indians, to cultivate an affectionate attachment from them, by everything just and liberal which we can do for them within... reason, and by giving them effectual protection against wrongs from our own people. Native American land was sometimes purchased, either via a treaty or under duress. The idea of land exchange, that is, Native Americans would give up their land east of the Mississippi in exchange for a similar amount of territory west of the river, was first proposed by Jefferson in 1803 and was first incorporated into treaties in 1817. The Indian Removal Act of 1830 incorporated this concept. Under President James Monroe, Secretary of War John C. Calhoun devised the first plans for Indian removal. By late 1824, Monroe approved Calhoun's plans and in a special message to the Senate on January 27, 1825, requested the creation of the Arkansas Territory and Indian Territory. The Indians east of the Mississippi were to voluntarily exchange their lands for lands west of the river. The Senate accepted Monroe's request and asked Calhoun to draft a bill, which was killed in the House of Representatives by the Georgia delegation. President John Quincy Adams assumed the Calhoun–Monroe policy and was determined to remove the Indians by non-forceful means, but Georgia refused to submit to Adams' request and forced[Clarification needed] Adams to make a treaty with Creeks and Cherokees granting Georgia what it wanted. 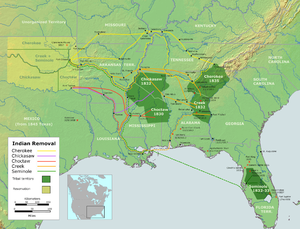 [Clarification needed] When Andrew Jackson became the president from the newly organized Democratic Party, he agreed that the Indians should be forced to exchange eastern lands for western lands. When Andrew Jackson became president of the United States in 1829, his government took a hard line. Jackson abandoned the policy of his predecessors of treating different Indian groups as separate nations. Instead, he aggressively pursued plans against all Indian tribes which claimed constitutional sovereignty and independence from state laws, and which were based east of the Mississippi River. They were to be removed to reservations in Indian Territory west of the Mississippi (now Oklahoma), where their laws could be sovereign without any state interference. At Jackson's request, the United States Congress opened a debate on an Indian Removal Bill. After fierce disagreements the Senate passed the measure 28–19, the House 102–97. Jackson signed the legislation into law May 30, 1830. In 1830, the majority of the "Five Civilized Tribes"—the Chickasaw, Choctaw, Creek, Seminole, and Cherokee—were living east of the Mississippi as they had for thousands of years. The Indian Removal Act of 1830 implemented the U.S. government policy towards the Indian populations, which called for moving Native American tribes living east of the Mississippi River to lands west of the river. While it did not authorize the forced removal of the indigenous tribes, it authorized the President to negotiate land exchange treaties with tribes located in lands of the United States. On September 27, 1830, the Choctaw signed the Treaty of Dancing Rabbit Creek and by concession, became the first Native American tribe to be removed. The agreement represented one of the largest transfers of land that was signed between the U.S. Government and Native Americans without being instigated by warfare. By the treaty, the Choctaw signed away their remaining traditional homelands, opening them up for European-American settlement in Mississippi Territory. When the Choctaw reached Little Rock, a Choctaw chief referred to the trek as a "trail of tears and death". While the Indian Removal Act made the move of the tribes voluntary, it was often abused by government officials. The best-known example is the Treaty of New Echota. It was negotiated and signed by a small faction of Cherokee tribal members, not the tribal leadership, on December 29, 1835. It resulted in the forced relocation of the tribe in 1838. An estimated 4,000 Cherokee died in the march, now known as the Trail of Tears. Missionary organizer Jeremiah Evarts urged the Cherokee Nation to take their case to the U.S. Supreme Court. The Marshall court ruled that while Native American tribes were sovereign nations (Cherokee Nation v. Georgia, 1831), state laws had no force on tribal lands (Worcester v. Georgia, 1832). In spite of this acculturation, many white settlers and land speculators simply desired the land. Some claimed their presence was a threat to peace and security. Some U.S. states, like Georgia in 1830, passed a law which prohibited whites from living on Native American territory after March 31, 1831, without a license from the state. This law was written to justify removing white missionaries who were helping the Native Americans resist removal. In 1835, the Seminole refused to leave their lands in Florida, leading to the Second Seminole War. Osceola led the Seminole in their fight against removal. Based in the Everglades of Florida, Osceola and his band used surprise attacks to defeat the U.S. Army in many battles. In 1837, Osceola was seized by deceit upon the orders of U.S. General Thomas Jesup when Osceola came under a flag of truce to negotiate peace. Osceola would die in prison of illness. The war would end up costing the U.S. over 1,500 deaths and cost the government $20 million. Some Seminole traveled deeper into the Everglades, while others moved west. Removal continued out west and numerous wars ensued over land. In the aftermath of the Treaty of Fort Jackson and the Treaty of Washington, the Muscogee were confined to a small strip of land in present-day east central Alabama. Following the Indian Removal Act, in 1832 the Creek National Council signed the Treaty of Cusseta, ceding their remaining lands east of the $3 to the U.S., and accepting relocation to the Indian Territory. Most Muscogee were removed to Indian Territory during the Trail of Tears in 1834, although some remained behind. Unlike other tribes who exchanged land grants, the Chickasaw were to receive mostly financial compensation of $3 million from the United States for their lands east of the Mississippi River. In 1836, the Chickasaw had reached an agreement that purchased land from the previously removed Choctaw after a bitter five-year debate. They paid the Choctaw $530,000 for the westernmost part of Choctaw land. The first group of Chickasaw moved in 1837. The $3,000,000 that the U.S. owed the Chickasaw went unpaid for nearly 30 years. As a result, the five tribes were resettled in the new Indian Territory in modern-day Oklahoma and parts of Kansas. Some indigenous nations resisted forced migration more forcefully. 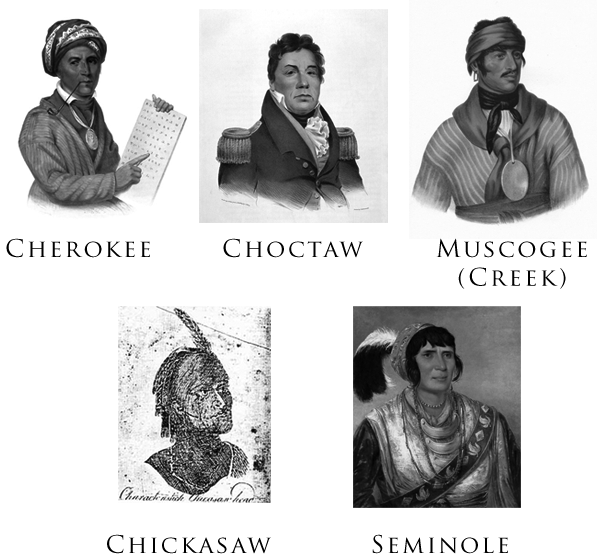 Those few who stayed behind eventually formed tribal groups including the Eastern Band Cherokee, based in North Carolina, the Mississippi Band of Choctaw Indians, the Seminole Tribe of Florida, and the Creeks in Atmore, Alabama. Many figures have been rounded. Tribes in the Old Northwest were far smaller and more fragmented than the Five Civilized Tribes, so the treaty and emigration process was more piecemeal. Bands of Shawnee, Ottawa, Potawatomi, Sauk, and Meskwaki (Fox) signed treaties and relocated to the Indian Territory. In 1832, a Sauk leader named Black Hawk led a band of Sauk and Fox back to their lands in Illinois. In the Black Hawk War, the U.S. Army and Illinois militia defeated Black Hawk and his warriors, resulting in the Sauk and Fox being relocated into what would become modern-day Iowa. The Iroquois were also supposed to be part of Indian removal, and the Treaty of Buffalo Creek arranged for them to be removed to land in Wisconsin and Kansas. However, the land company that was to purchase the land for the territories reneged on their deal, and subsequent treaties in 1842 and 1857 gave back most of the Iroquois' reservations untouched. Only the Buffalo Creek Reservation was ever dissolved as part of the removal program; a small portion was purchased back over a century later to build a casino. Recent Jackson biographers, such as Jon Meacham and H.W. Brands, candidly described the human cost of Jackson’s policy while keeping it in the perspective of his broader career. Sean Wilentz, in The Rise of American Democracy, observed that while Jackson was a “paternalist,” telling Indians what was best for them, paternalism was not the same as genocide. ↑ Lewey, Guenter (September 2004). "Were American Indians the Victims of Genocide?". http://historynewsnetwork.org/article/7302. Retrieved 24 July 2015. ↑ Rajiv Molhotra (2009). "American Exceptionalism and the Myth of the American Frontiers". In Rajani Kannepalli Kanth. The Challenge of Eurocentrism. Palgrave MacMillan. pp. 180, 184, 189, 199. ↑ Paul Finkelman and Donald R. Kennon (2008). Congress and the Emergence of Sectionalism. Ohio University Press. pp. 15,141,254. ↑ "Removing native americans from their land". Library of Congress. http://www.loc.gov/teachers/classroommaterials/presentationsandactivities/presentations/immigration/native_american2.html. Retrieved 24 July 2015. ↑ Jefferson, Thomas (1782). "Notes on the State of Virginia". Revolutionary War and Beyond. http://www.revolutionary-war-and-beyond.com/notes-on-the-state-of-virginia-by-thomas-jefferson-1781-1782-2.html. Retrieved 2014-07-14. ↑ 7.0 7.1 Prucha, Francis Paul (1984). The Great Father: The United States Government and the American Indians. University of Nebraska Press. ↑ Staff Writer. "President Jefferson and the Indian Nations". The Jefferson Monticello. http://www.monticello.org/site/jefferson/president-jefferson-and-indian-nations. Retrieved 2014-07-14. ↑ 20.0 20.1 Jefferson, Thomas (1803). "President Thomas Jefferson to William Henry Harrison, Governor of the Indiana Territory,". http://courses.missouristate.edu/ftmiller/Documents/jeffindianpolicy.htm. Retrieved 2009-03-12. ↑ Prucha, Francis Paul (1997). American Indian Treaties: The History of a Political Anomaly. Berkeley: University of California Press. ISBN 978-0-520-91916-7. ↑ Mahon, John K., History of the Second Seminole War: 1835–1842, University of Florida Press, 1985, pp. 57, 72. ↑ 25.0 25.1 25.2 25.3 25.4 25.5 Sharyn Kane & Richard Keeton. "Fort Benning – The Land and the People". SEAC. http://www.nps.gov/history/seac/benning-book/ch11.htm. Retrieved 2010-08-07. ↑ Sandra Faiman-Silva (1997). Choctaws at the Crossroads. University of Nebraska Press. p. 19. ISBN 978-0803269026. http://books.google.com/books?id=DS5LgMyvYNAC&pg=PA19&dq=%22trail+of+tears+and+death%22+choctaw&hl=en&sa=X&ei=3fssU4bTC_Dh0wG8h4CIAQ&ved=0CDoQ6AEwAw#v=onepage&q=%22trail%20of%20tears%20and%20death%22%20choctaw&f=false. ↑ de Tocqueville, Alexis (1835–1840). "Tocqueville and Beaumont on Race". http://xroads.virginia.edu/~HYPER/DETOC/race/indian.html. Retrieved 2008-04-28. ↑ Hoxie, Frederick (1984). A Final Promise: The Campaign to Assimilate the Indians, 1880–1920. Lincoln: University of Nebraska Press. ↑ Robert Remini, Andrew Jackson and his Indian Wars, p. 257. ↑ Zinn, Howard. A People's History of the United States Harper Perennial Modern Classics. p. 146. ↑ Jesse Burt & Bob Ferguson (1973). "The Removal". Indians of the Southeast: Then and Now. Nashville: Abingdon Press. pp. 170–173. ISBN 0-687-18793-1. ↑ Foreman, p. 47 n.10 (1830 census). ↑ Several thousand more emigrated West from 1844–49; Foreman, pp. 103–4. ↑ Foreman, p. 111 (1832 census). ↑ Russell Thornton, "Demography of the Trail of Tears", p.85. ↑ Low figure from Prucha, p. 233; high from Wallace, p. 101. ↑ Lewis, James. "The Black Hawk War of 1832", Abraham Lincoln Digitization Project, Northern Illinois University, p. 2D. Retrieved July 12, 2011. ↑ See also Barbara Alice Mann (2009). The Tainted Gift: The Disease Method of Frontier Expansion. ABC-CLIO. p. 20. http://books.google.com/books?id=vJcJmx8R8XIC&pg=PA20. ↑ Paul R. Bartrop and Steven Leonard Jacobs (2014). Modern Genocide: The Definitive Resource and Document Collection. ABC-CLIO. p. 2070. http://books.google.com/books?id=JB4UBgAAQBAJ&pg=PA2070. ↑ Sean Wilentz (2006). The Rise of American Democracy: Jefferson to Lincoln. Norton. p. 324. http://books.google.com/books?id=2kybvdPsBTYC&pg=PA324. Anderson, William L., ed. Cherokee Removal: Before and After. Athens, Georgia: University of Georgia Press, 1991. ISBN 0-8203-1482-X. Jahoda, Gloria. The Trail of Tears: The Story of the American Indian Removals 1813-1855. Holt, Rinehart and Winston. New York. 1975. ISBN 0-03-014871-5. Prucha, Francis Paul. American Indian Treaties: The History of a Political Anomaly. University of California Press, 1994. ISBN 0-520-20895-1. University of Oklahoma Press, 2002. ISBN 978-0-8061-3432-1 (2002 edition). Strickland, William M. "The rhetoric of removal and the trail of tears: Cherokee speaking against Jackson's Indian removal policy, 1828–1832." Southern Journal of Communication 47#3 (1982): 292-309. Thornton, Russell. American Indian Holocaust and Survival: A Population History Since 1492. Norman, Oklahoma: University of Oklahoma Press, 1987. ISBN 0-8061-2074-6.